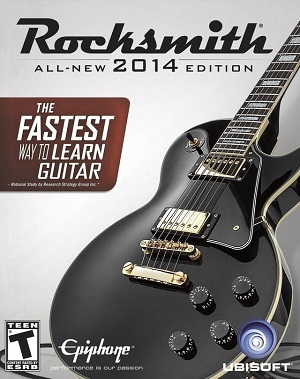 Rocksmith Real Tone cable is not included with digital purchases. Compatible with Rocksmith Real Tone cables. Guitar requires standard 1/4" output jack to be compatible. Remastered edition available as a free upgrade. Includes the Rocksmith Real Tone Cable. Does not include the Rocksmith Real Tone Cable. All versions require Steam, Uplay, and Denuvo Anti-Tamper DRM. The Rocksmith Real Tone Cable is available on Amazon.com and at various other retailers. 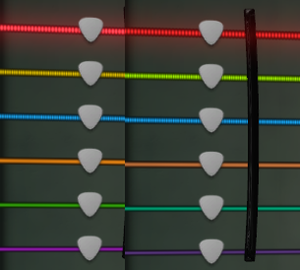 Demonstrating the Rocksmith 2014 color blind differences during tuning. Left side is color blind disabled, right side is enabled. Allows to set the resolution but the game is always pillarboxed. Official configuration manual suggests switching to stereo in the OS. Can be toggled in settings menu. ↑ 2.0 2.1 File/folder structure within this directory reflects the path(s) listed for Windows and/or Steam game data (use Wine regedit to access Windows registry paths). Games with Steam Cloud support may store data in ~/.steam/steam/userdata/<user-id>/221680/ in addition to or instead of this directory. The app ID (221680) may differ in some cases. Treat backslashes as forward slashes. See the glossary page for details. This page was last edited on 11 April 2019, at 23:30.